Birthday Frames for Any Year. Our custom birthday frames for any year make a special birthday gift from the year you were born. Our custom laser engraved picture frame scan be used for any birthday gift idea. we have frames available for most birth years through year 1981. 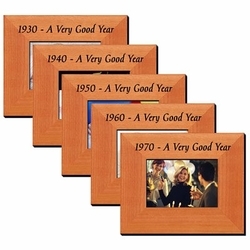 Each wood frame is custom lasered to say " (Your Year) - A Very Good Year" e.g. "1967- A Very Good Year, at the top. The frames are 3.5" x 5" in size. See our other milestone birthday gifts.